Citation Information: J Clin Invest. 2018;128(5):2064-2075. https://doi.org/10.1172/JCI96147. Receptor interacting protein kinase 1 (RIPK1) has important kinase-dependent and kinase-independent scaffolding functions that activate or prevent apoptosis or necroptosis in a cell context–dependent manner. The kinase activity of RIPK1 mediates hypothermia and lethality in a mouse model of TNF-induced shock, reflecting the hyperinflammatory state of systemic inflammatory response syndrome (SIRS), where the proinflammatory “cytokine storm” has long been viewed as detrimental. Here, we demonstrate that cytokine and chemokine levels did not predict survival and, importantly, that kinase-inactive Ripk1D138N/D138N hematopoietic cells afforded little protection from TNF- or TNF/zVAD-induced shock in reconstituted mice. Unexpectedly, RIPK1 kinase–inactive mice transplanted with WT hematopoietic cells remained resistant to TNF-induced shock, revealing that a nonhematopoietic lineage mediated protection. 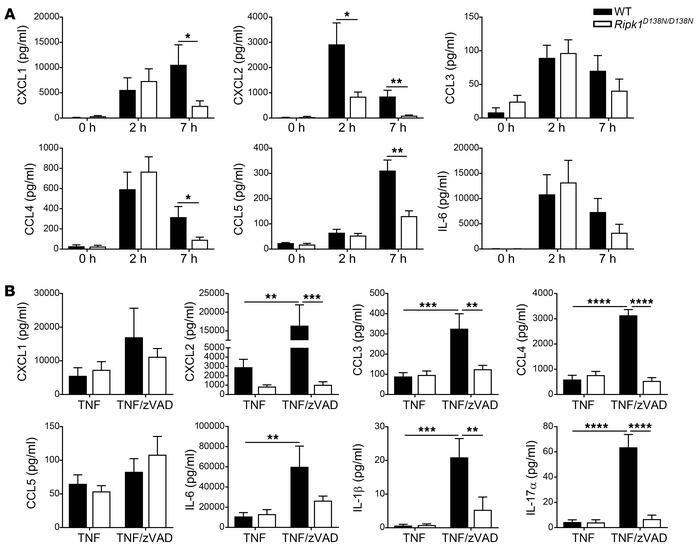 TNF-treated Ripk1D138N/D138N mice exhibited no significant increases in intestinal or vascular permeability, nor did they activate the clotting cascade. We show that TNF administration damaged the liver vascular endothelium and induced phosphorylated mixed lineage kinase domain-like (phospho-MLKL) reactivity in endothelial cells isolated from TNF/zVAD-treated WT, but not Ripk1D138N/D138N, mice. These data reveal that the tissue damage present in this SIRS model is reflected, in part, by breaks in the vasculature due to endothelial cell necroptosis and thereby predict that RIPK1 kinase inhibitors may provide clinical benefit to shock and/or sepsis patients. Ripk1D138N/D138N mice exhibit impaired cytokine and chemokine production in response to TNF and TNF/zVAD administration in vivo. (A) Plasma cytokine and chemokine levels in WT and Ripk1D138N/D138N mice 2 and 7 hours after i.v. TNF administration (n = 8–9) or (B) 2 hours after i.v. TNF or TNF/zVAD administration (n = 6–9). TNF-induced levels are repeated from A. Data are shown as mean ± SEM. *P < 0.05; **P < 0.01; ***P < 0.001; ****P < 0.0001, 2-tailed Student’s t test (A) or 2-way ANOVA with post hoc Tukey’s test (B).